Peter Alston (? ?-1804) – A late 18th Century and early 19th Century counterfeiter, horse thief, highwayman, and river pirate, who was believed to be the associate of serial-killer, Little Harpe and partner, in the murder of notorious outlaw, leader Samuel Mason in 1803. Alexander Amand (? ?-1718) – From Jamaica, Amand was part of Major Stede Bonnet’s crew in the Royal James. He was hanged on November 8, 1718 at White Point, Charleston, South Carolina, and buried in the marsh below the low water mark. 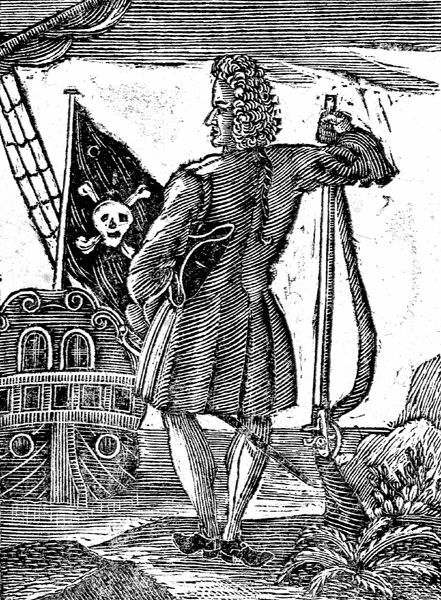 John Rose Archer – He served in the crew of Blackbeard’s Queen Anne’s Revenge. Later he became an honest fisherman but turned pirate again. Job Baily (? ?-1718) – Originally from London, England, Baily sailed with Stede Bonnet. He was He was hanged on November 8, 1718, in Charleston, South Carolina. Captain Charles Bellamy – Bellamy began his career in the West Indies before capturing and plundering numerous vessels off the coasts of Carolina and New England. He was noted as an orator, sometimes entertaining his prisoners with flowery speeches. His pirate fleet wrecked on Massachusetts coast in 1726 and only Bellamy and seven of his crew A members were saved. They were tried, condemned, and hanged in Boston that same year. James Blake (? ?-1718) – A member of Blackbeard’s crew, Blake was hanged in Williamsburg, Virginia in 1718. Major Stede Bonnet, aka: Captain Thomas, Edwards (? ?-1718) – Known as “The Gentleman Pirate”, Bonnet was born into wealth and owned a plantation on Barbados, but threw it away to become a pirate. After Bonnet retired from the army with the rank of major, he began a piratical career on the island of Barbados. In the Revenge he captured prizes off the Virginia, Pennsylvania, and Carolina coasts. At one time he joined forces with Blackbeard. He was captured in the Cape Fear River on September 27, 1718, by Colonel William Rhett of South Carolina. He was taken to Charleston, South Carolina, where he escaped, but was recaptured by Colonel Rhett. He was tried, convicted, and sentenced to the gallows in a Charleston Court and hanged on December 10, 1718. His body was buried in the marsh below the low water mark. Anne Bonny (or Bonney) (1700-1782) – A female pirate, Bonny was born in County Cork, Ireland. She was the daughter of a lawyer, who migrated to “Carolina” and became the owner of a prosperous plantation. Anne fell in love with a handsome young sailor, ran away to the West Indies with him. Leaving her husband, Anne sailed on Captain “Calico Jack” Rackham’s ship, where she gained fame as a bloodthirsty pirate. Captured, she was tried and convicted of piracy, but there are no records indicating she was ever hanged. Samuel Booth(? ?-1718) – From Charleston, South Carolina, Booth was A member of Stede Bonnet’s crew. He was hanged on November 8, 1718 at Charleston, South Carolina. Robert Boyd(? ?-1718) – From Bath, North Carolina, Boyd was a member of Stede Bonnet’s crew. He was hanged on November 8, 1718, at Charleston, South Carolina. John Brierly, aka Timberhea (? ?-1718) – From Bath, North Carolina, Boyd was a member of Stede Bonnet’s crew. He was hanged on November 8, 1718, at Charleston, South Carolina. Joseph Brooks, Sr. (? ?-1718) – A member of Blackbeard’s crew, he was killed on November 22, 1718, at Ocracoke Inlet in the fight with Lieutenant Maynard’s crew. Joseph Brooks, Jr. (? 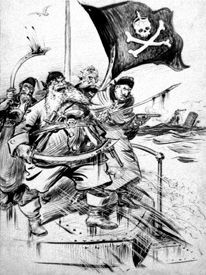 ?-1718) – A member of Blackbeard’s crew, he was taken prisoner by Lieutenant Maynard’s crew at Ocracoke Inlet. He was then taken to Williamsburg, Virginia, where he was hanged in 1718. Dixie Bull (or Dixey Bull) – An English sea captain and the first pirate known to prey on shipping off the New England coast, especially Maine. A native of London, he came to Boston in 1631 and started sailing the Maine coast with a small vessel, trading with the Indians. 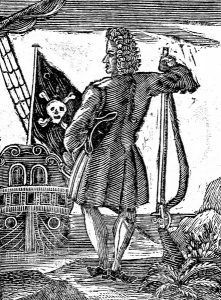 Captain Samuel Burgess – Captain Samuel Burgess was a member of Captain William Kidd’s crew in 1690 when the Blessed William was seized. Caesar – A black member of Blackbeard’s crew, he was much liked and trusted by Blackbeard, and was entrusted with the job of blowing up the Adventure if the pirates were defeated by Lieutenant Maynard’s crew. He attempted to carry out this order but was prevented by two of the frightened pirates. Caesar was hanged in Williamsburg, Virginia in 1718. Thomas Carman – From Maidstone in Kent, England. A member of Stede Bonnet’s crew. He was hanged on November 8, 1718, in Charleston, South Carolina. John Carnes – A member of Blackbeard’s crew, he was hanged in Williamsburg, Virginia in 1718. Thomas Child – A member of Captain Edward Low’s crew. At the age of 15, he was tried for piracy at Newport, Rhode Island in 1723 and found not guilty. John Churchill – A member of Captain George Lowther’s crew, Churchhill was captured in West Indies and hanged on March 11, 1722, on the island of St. Kitts. Jonathan Clarke – From Charleston, South Carolina, he was a member of Stede Bonnet’s crew. He was tried for piracy at Charleston in 1718 but was acquitted. Edward Coates – A colonial American privateer in English service during the King William’s War and later a pirate operating in the Red Sea and the Indian Ocean during the mid-1690s. Samuel Cole – A member of William Fly’s crew, he was hanged at Boston, Massachusetts on July 12, 1726. George Condick – A cook with the crew of William Fly, he was convicted in a trial at Boston, Massachusetts but later, was pardoned. Patrick Conway (1846-??) – Commonly known by his alias Patsy or Patsy Conroy, was an American burglar and river pirate. 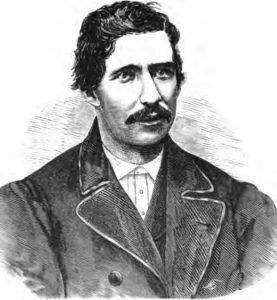 He was the founder and leader of the Patsy Conroy Gang, a gang of river pirates active on the New York waterfront in the old Fourth Ward and Corlears’ Hook districts during the post-American Civil War era. Stephen James De Cossey – He was tried and hanged for piracy at Charleston, South Carolina in 1717. Joseph Curtice (? ?-1718) – A member of Blackbeard’s crew, he was killed on November 22, 1718, at Ocracoke Inlet during the fight with Lieutenant Maynard’s crew. Stephen Daniel (? ?-1718) – A member of Blackbeard’s crew, he was hanged in Williamsburg, Virginia, in 1718. Captain Robert Deal (? ?-1718) – A one time shipmate of Captain Charles Vane, he was later placed in command of small sloop. After taking many prizes off the coasts of Carolina and New England, he was captured in West Indies and hanged in Jamaica in 1718. Jonathan Delve (? ?-1722) – A member of Captain George Lowther’s crew on the Happy Delivery, he was hanged at St. Kitts in 1722. George Dunkin (? ?-1718) – Of Glasgow, Scotland, he was a member of Stede Bonnet’s crew. He was hanged at Charleston, South Carolina, on November 8, 1718. William Eddy(? ?-1718) Of Aberdeen, Scotland, he was a member of Stede Bonnet’s crew. He was hanged at Charleston, South Carolina on November 8, 1718. Emanuel Ernados (? ?-1717) – A Carolina pirate who was hanged at Charleston, South Carolina in 1717.